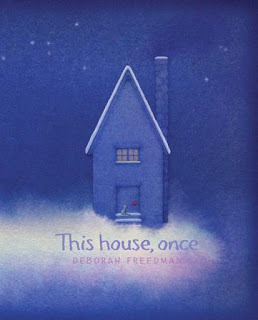 This House, Once is a goose-bump triggering picture book. A beautiful story brought to life through stunning illustrations, it is different and wonderful and glorious. The story is about a house, what the house is made of and where its individual parts come from. It’s a story about small pieces adding up to a beautiful whole. It’s a story about nature and the different ways our natural world provides us with the things we need—like doors and walls and the roofs upon our homes. These stones were once below, underground, deep asleep, tucked beneath a blanket of leaves. Deborah Freedman’s way with words is magical, but her talents extend further to the artwork found between the lilac cloth bound covers. Smudgy, speckled pastels coat the pages with repeated splashes of purples, pinks and reds. A little kitten roams the illustrations, playing in the mud, digging for rocks and exploring the landscape that provides the materials to build the star of the book—This House. This book will make you feel warm and calm inside. With poetic phrases that roll off the tongue, it is a pleasure to read aloud and makes a lovely bedtime story. And, yet, it is also a book for schools. Without being forced, this story has a wonderful message. It teaches kids not to take the things around them for granted. It encourages them to think about where things come from and the processes involved in transforming things—like giant oak trees becoming front doors. This House, Once is a treasure. The words, the language, the illustrations, the curiosity and questioning it will spark make this a picture book everyone can enjoy and share.